Super Joint Cleanse is a product in a series created by the manufacturer to help address issues related to various areas in the body, including joints. The product is aimed at reducing inflammation, providing your joints with the needed antioxidants to combat aging, and assist the normal joint function. From the look of ingredients, Super Joint Cleanse seems like a potent formula, so we decided to take a closer look and see all its ups and downs. What Does Super Joint Cleanse Contain? The most important ingredient on this list is glucosamine, which is a key compound for maintaining healthy joints. The presence of minerals and vitamins is also commendable, and boswellia serrata and turmeric are two herbal remedies with a long history in helping people get treatment for aging joints. However, since certain important ingredients are not included, like hyaluronic acid and chondroitin, this health supplement may not be the most potent on the market. 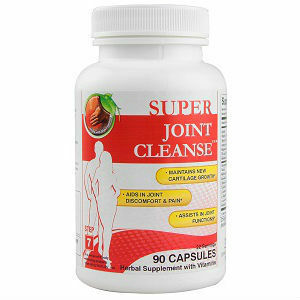 The recommended dosage for Super Joint Cleanse is four pills taken three times daily. As you can see, there are quite a lot of pills to be taken in one go, which may suggest the formula is not very strong. The listing price for a bottle with 90 capsules, or 22 servings, is 18.99USD. While the price is not steep at all, you must consider the fact that taking no less than 12 pills daily will have you go through one bottle in just a week. We saw no clear signs of a guarantee policy on the manufacturer’s website, so you may have to contact them directly to address any issues with your order and your product. The list of ingredients for Super Joint Cleanse is quite long, including vitamins, minerals, herbal remedies and the much appreciated glucosamine and MSM. However, the fact that there is no hyaluronic acid included is not that great a sign, since this compound is responsible for making your joints more flexible and combating aging. All in all, Super Joint Cleanse is not a bad product, but it is not the best you can find, either. Mark Stevens	reviewed Super Joint Cleanse	on April 6th	 and gave it a rating of 2.